The Soca River in Slovenia is a 140 km long river flowing through the Western part of the country and then running over to North-Eastern Italy. The river starts off from the Trenta valley of the Julian Alps, Slovenia. Moving forward, the river enters a valley surrounded by a ring of mountains. The most well-known region within this mountainous area is the Triglav peak, which is again famous as the highest crest of the place. The river then runs through some other cities such as Bovec, Nova Gorica, Kobarid, Tolmin and Gorizia. Finally, the Soca completes its journey as it enters the Adriatic Sea. 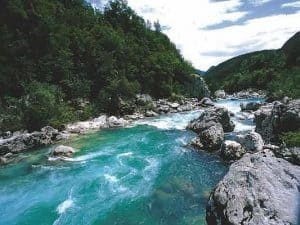 The river has a historical significance as well, as the adjoining Soca Valley formed the backdrop of some of the foremost military activities that took place during the time of World War I. The river valley is also called as “The Emerald Beauty”, signifying the impossibly beautiful emerald green waters of the Soca River! Now, such a beautiful river is bound to create the perfect platform for joyous rafting expeditions. With amazing whitewaters and rising waves, a rafter can get ample opportunities to test his rafting expertise on the waters. The torrents and the proximity of the waves will make you crazy like never-before. As the river is pretty calm in most of the bends, it is recognized as the best place for both beginners and experienced rafters. So, as you make up your mind to spend some enthralling moments in your short weekend, going rafting on the Soca is the activity you must opt for! Well, if you are looking forward to a safer ride, don’t forget to pack up the essential ingredients. So, are you ready to visit one of the most happening rafting destinations in the world – the entrancing “River Soca? This region of Slovenia is also excellent for canyoning.